SustainableWork: Bob's Bitchin' BBQ. "It was the start of a new business." Bob's Bitchin' BBQ. "It was the start of a new business." Bob Page and his wife Judy are excellent culinary entrepreneurs who have found a home at the Wisconsin Innovation Kitchen. I love the slogan for their new barbeque sauce company: "So good you'll lick your napkin." I think their story makes great sense for other folks who want to expand food enterprises by having their products made for them safely in a state-inspected, professionally staffed processing kitchen. A recent article in the Wisconsin State Journal featured Bob's work (emphasis added): "For many, giving homemade gifts — pretty jars of cookie mix, quince preserves, cherry brandy — is an annual tradition." 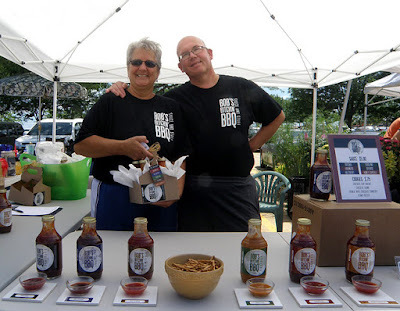 "For former caterer Bob Page, it was the start of a new business." "'I always give my employees for Christmas some handmade gift, a food gift,' said Page, who runs the cafeteria at Land’s End Corporation Headquarters in Dodgeville." "Bob’s Bitchin’ BBQ launched on July 1.... 'I believe in doing flavors that are going to make the food stand out more than the sauce,' Page said. 'You’re tasting the food — you get a little burn (from the habañero) as it’s going down your throat, but it’s not so much that you’re going to need a glass of water.'" "More recently, Page has added a Honey Chipotle version (with 'a little more sting to it') and a dry rub made with paprika, cumin, chile, seasoned salt, cayenne, garlic, brown sugar and onion." As with all new enterprises, there are many new challenges for all involved. I love their attitude: challenges = opportunities to learn and grow. We're grateful to Bob and Judy, and the opportunity to help grow their amazing food lines. They are helping us grow as we help them grow. Congratulations Bob's Bitchin' BBQ! Your friends at the Wisconsin Innovation Kitchen are cheering you on! Hello there! I could have sworn I’ve been to this weblog just before but soon after searching by way of a few of the submit I recognized it is new to me. Anyways, I’m surely delighted I discovered it and I’ll be book-marking and checking back again regularly! Welcome Wisconsin Maple Syrup Producers!